Onscreen, the "Rock of Ages" star hooks up with Tom Cruise's bad-boy singer. In real life, she married her band's drummer. Malin Akerman's put her real-life rock cred to use on "Rock of Ages" and her upcoming stint playing Debbie Harry. Indeed, Akerman happily shares tales of rocking out, her next movie gig set in the real world of rock, which celebrity left her speechless and why it's not necessarily a bad thing to sleep with your bandmate. What 80s-era item was it great to revisit, and what should be permanently left back there? I think we can leave mullets back in the '80s. I did like the permed hair that I had in it. That was great, and I think that we should always have '80s music, forever and ever and ever. I'm a big fan. The hit musical about an aspiring young rocker and an aging superstar finally makes it to the big screen with an all-star cast including Tom Cruise, Julianne Hough, Russell Brand, Paul Giamatti, Catherine Zeta-Jones, Mary J. Blige, Bryan Cranston and Alec Baldwin. Opens June 15. Were any of the '80s fashion choices in the film to your liking? I would kind of wear what she wore in the scene where she gets her face licked. I love the black, the tassels and the leather, obviously. I haven't let go of that. I love all things leather, and so I love that from her outfits as well. But I don't know if I would necessarily do the Mozart top; the button-down, 'Hot For Teacher' kind of look. That's not really my thing. Did you keep a souvenir from "Rock of Ages"? Tom Cruise on Singing in "Rock Of Ages": "It's Really Fun"
Tom Cruise chats about how he learned to sing and play guitar to prepare for his new movie, "Rock of Ages." 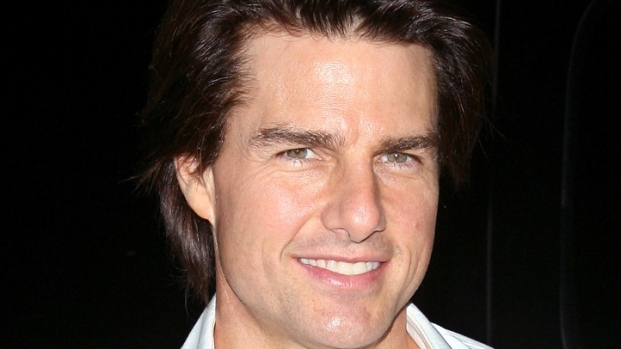 Plus, Tom talks about the soon-to-be-released trailer for "Mission: Impossible - Ghost Protocol. I did – Lita Ford came by set, which was awesome, and I have a leather jacket of hers. She lent some of her clothes to this movie, and then she said, 'If anyone wants to buy them, I'll sell them for, like, a hundred bucks a piece.' I was like, 'Yeah! I'll take Lita Ford's jacket for a hundred bucks!’ It's hand-painted on the back. It's so cool. I'm going to keep that forever. I would buy that on eBay for a thousand dollars. Was it hard to keep a straight face during your face-licking seduction scene with Tom Cruise? You play a journalist in the film. What's the weirdest interview experience you've ever had? There were a few weird ones while we were doing 'Watchmen.' One guy came in – we were in Europe somewhere – and he came in dressed in a mask, in a superhero costume – his own one, like made up. It was like a dirty sock with holes in it and he'd painted something on it and he was like, 'I am…' I can't remember the name of what his superhero was. I was like, 'Okay.' He goes, 'Why are all superheroes only American?' I said, 'I don't know – are they?' He came in and was so anti-American, and then he took off his mask and went 'Ah, it's not working. Never mind, never mind,' and he got up and left. I was like 'Ooookay...' I didn't even know what was working or wasn't working, because nothing was working for me. It was the weirdest thing ever. I don't know what he was getting at, but obviously I wasn't giving him what he wanted. Which celebrity had that turn-to-jelly Stacee Jaxx affect on you in real life? Oh my goodness – one of the first that I met that did to me was Steven Spielberg. I still get speechless when I think about it. He's done so much in his life and he's so brilliant, and I got to work with him – or work for him, for his company – on 'Heartbreak Kid,' which is one of the first films that I did out here. I was sitting in my chair on set and he came and sat beside me. I was eating soup. I'll never forget because I was like, 'I don't know if I should continue eating my soup because I don't know if I'll spill it on myself or if it's rude to talk with soup in your mouth.' The stupidest thing was that I was so concentrated on this soup that after a while no words were coming out of my mouth. He was like, 'All right, nice chatting with you, Malin. I'll see you later.' I was like, 'God – I didn't say anything!' But I have walked by Mick Jagger at a party and I could smell his hair and that was awesome. That was really great. And you'll be playing a rock icon soon. The next one I'll be doing is a movie about CBGB, playing Debbie Harry. I haven't met her. I would love, too. I met her drummer – Clem [Burke] – and that was really amazing and he had a lot of stories about her. She's apparently a really cool chick, which is no surprise. The focus is really about CBGB and the beginnings of it, and the owner, Hilly Kristal, who created it. How gritty does that film get? Because ‘Rock of Ages’ is more of a fun fantasy version of an era's club scene and music industry? This one will be more gritty, for sure. This will be a little bit more reality as opposed to big dance numbers and things like that. More documenting the real moments and the real bands and how they became who they are and what happened at CBGB. So, I think it'll be a lot…also the budget is a lot smaller, so it'll be a shorter shooting period. I sing 'X Offender' – and not 'Heart of Glass.' I guess that came later, because this is in '73/'74. So, It's some of her first songs. You've fronted a rock band yourself, right? At least one good thing came out of your rock and roll experience, right? It certainly did. I got my husband from it. He was my drummer, and it's funny because a friend of mine gave me a book right when I became a part of their band, and the book was titled "Don't Sleep With Your Drummer." Guess who I married? The drummer. You challenge me and I'll do it. It's horrible. With such firsthand knowledge, can you explain the appeal of the rocker? It's so funny because you think you're attracted to this bad boy…Rockers are freedom of speech. They do whatever they want, and ultimately you don't really want that. You don't want someone who's out on a tour bus, sleeping around with different people and doing whatever and getting wasted. The funny thing is that my husband couldn't be sweeter. He looks like this bad boy. He's got tattoos and earrings and a Mohawk, but when you talk to him and when he's around you, he's such a gentleman. He's an Italian boy who grew up in the south of Italy with a family. His parents have been together for 40 years and he takes such good care of his mom. It's just beautiful, and so ultimately, I guess I don't really want that. I like the image. I love watching him be real and visceral on stage. I think anyone, when you watch them do what they do best, is attractive.